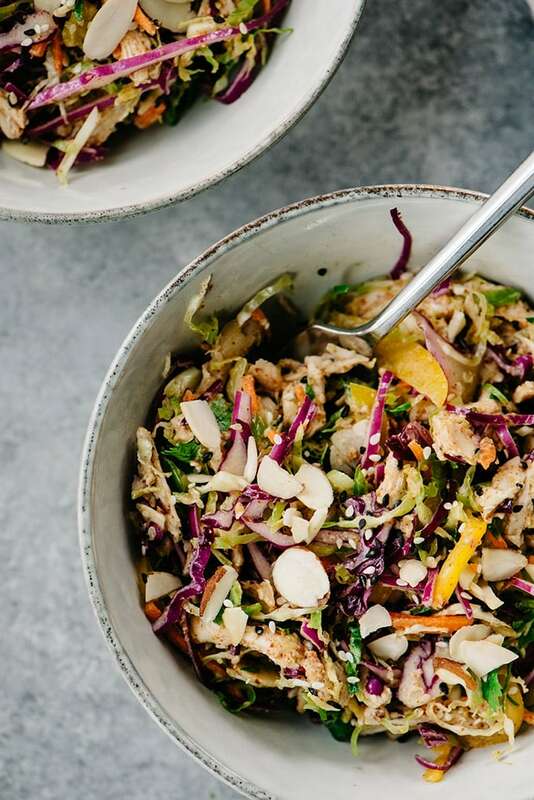 Skip the mayo and make this healthy chicken salad with almond butter dressing! 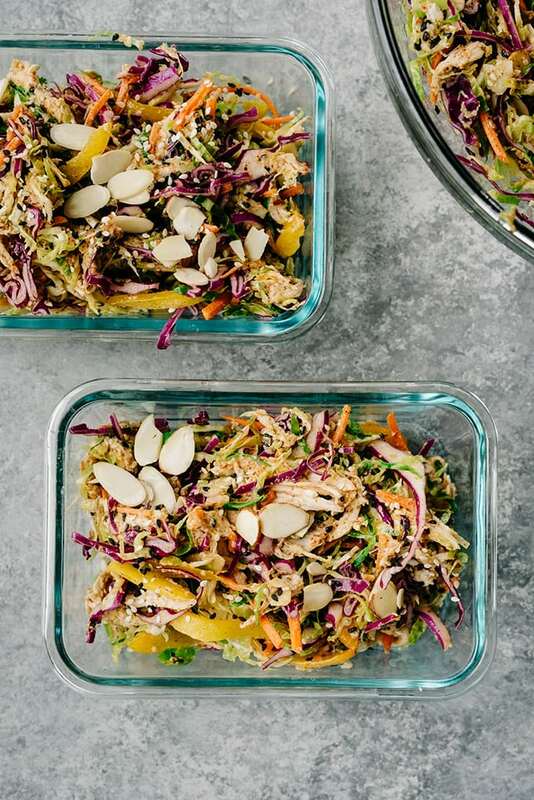 This fast and easy meal prep recipe is packed with fresh, colorful veggies and crunchy nuts and seeds, then finished with a creamy, no mayo almond butter dressing. It’s naturally paleo, Whole30, gluten free, and low carb, and comes together in under 30 minutes. You’ll never go back to heavy mayo chicken salads after you’ve tried this flavor-packed almond butter version! Crunchy – raw veggies? nuts? seeds? All of the yes. 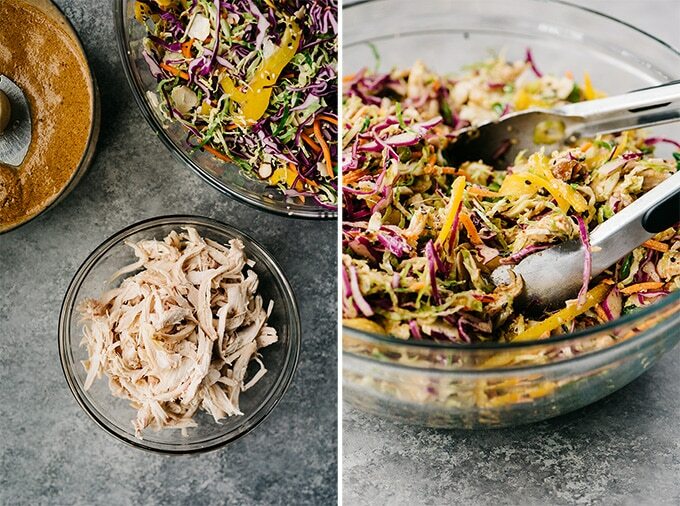 Colorful – the rainbow-iest eat-the-rainbow chicken salad there ever was. 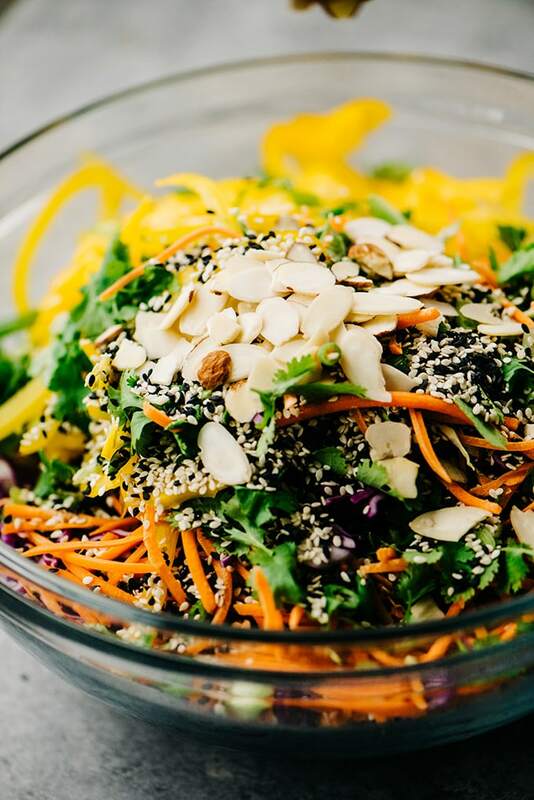 Nutrient dense – this salad rocks all of your Vitamin C for the day with a big punch of Vitamin A, calcium, and iron too. Lots of protein business, not too many carbs (if that’s your thing). 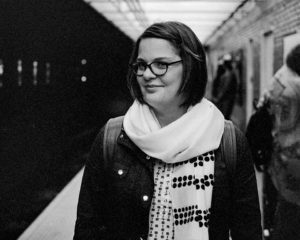 Fast – 25 minute (or less!) meals are always in fashion. Stupid easy – can you toss things? can you blend things? Cool. You can make this salad. No mayo – I’m a total mayo hater, I own it. Finished with a creamy, dreamy, sweet and nutty almond butter dressing that will beckon you to lick the bow, homemade icing style. Revisit your childhood, but you know…healthily. Are ya getting my drift? 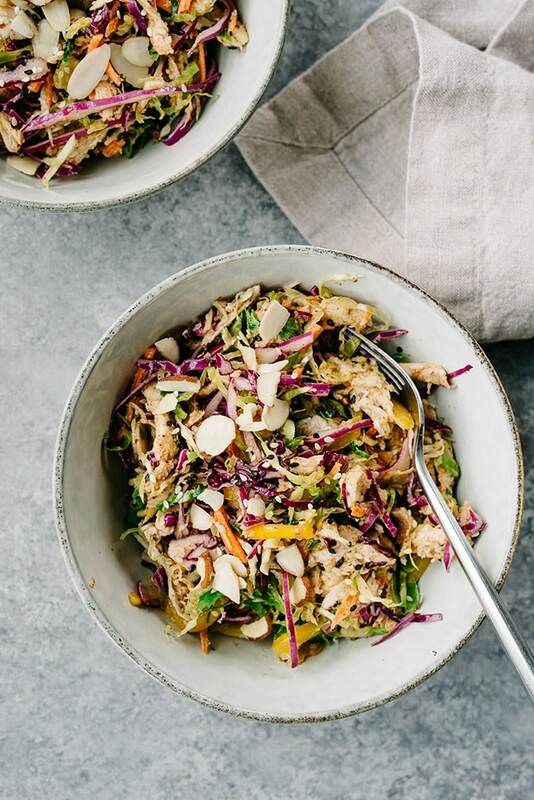 If not, I’ll spell it out – if you like tasty, healthy food, you’re going to LOVE this almond butter chicken salad recipe. >>> Pin it now! Click here to save this Healthy Chicken Salad to your Meal Prep Recipes board on Pinterest. 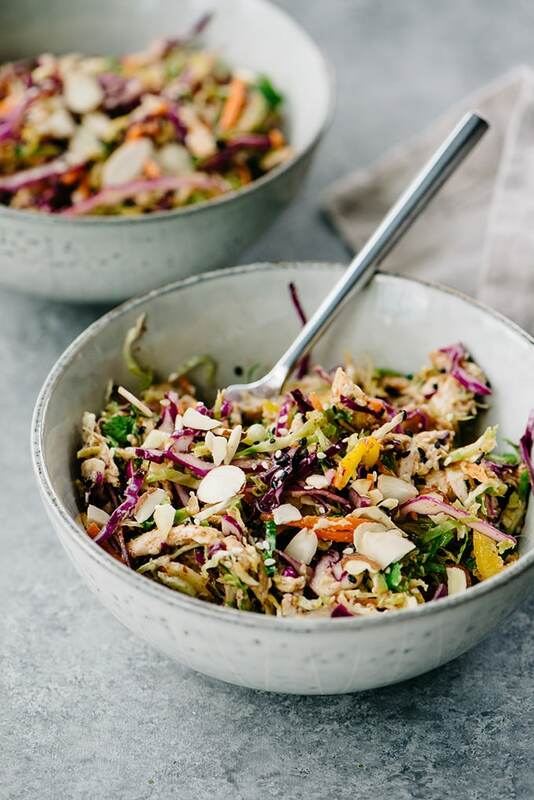 You need just thirty minutes to make this tasty, protein packed healthy chicken salad as long as you’ve got some leftover roasted chicken or poached chicken on hand. And if you don’t, go ahead and roast your own whole chicken, or poach up some chicken breasts. If you’re poaching, two breasts, or about a pound, should do it. Shred some shreddable veggies. 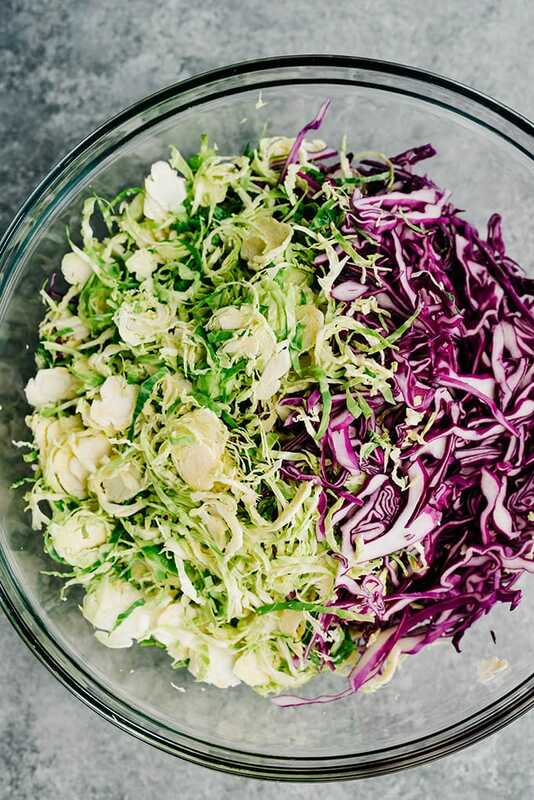 I used brussels sprouts and red cabbage, and this task took only 10 minutes using my trusty vegetable mandoline. 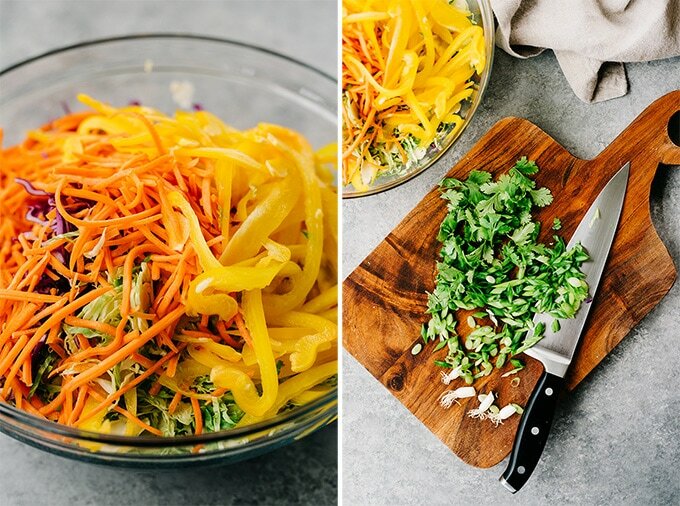 Go ahead and buy pre-shredded veggies if you don’t have a mandoline or want to save some time. I’ll keep your secret just between us. 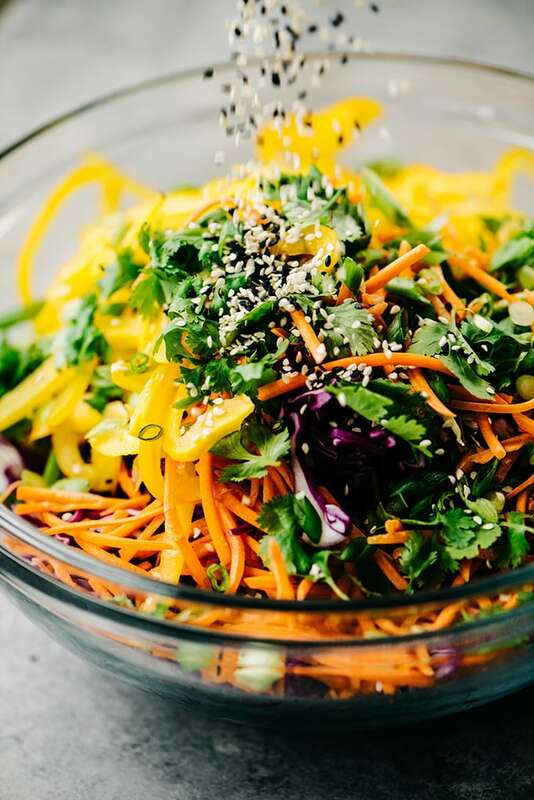 Top your salad base with some shredded carrots and a very thinly sliced bell pepper, then some green onions and cilantro. Don’t like cilantro? Totally fine – use parsley or chives instead, or skip it. Now for some crunch! Sesame seeds. These are called “tuxedo” sesame seeds because they’re black and white. So freaking cute. Use all black. Use all white. Just don’t skip ’em, k? More crunch! Side bar: my toddler still uses a few signs to communicate, and his favorite sign is “more”. He’ll stand in front of the pantry, putting his little fingertips together chanting “Mo! Mo-mo!” to politely request demand more snacks. It was just such an interruption that inspired the addition of more crunch. Sliced almonds also pack in some extra protein and healthy fats. Toss that lovely mess o’ veggies, nuts and seeds together, and then set it aside and make the dressing. 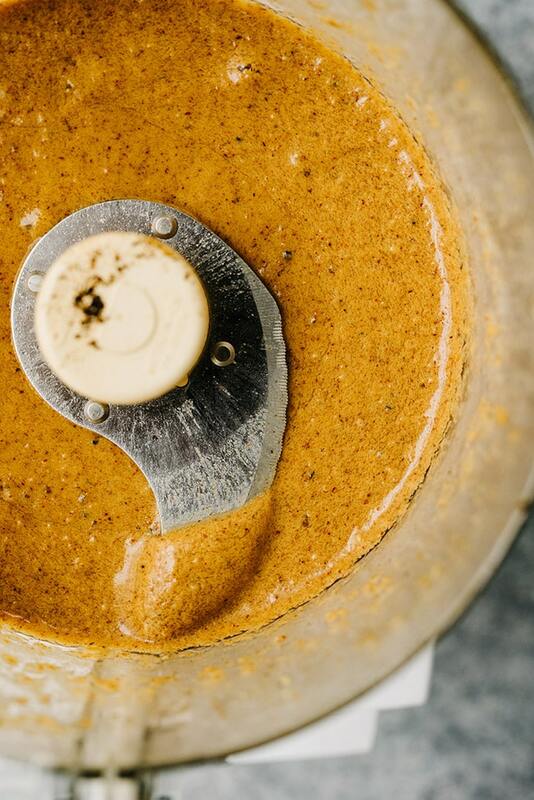 Next step is this RIDICULOUSLY tasty almond butter dressing. Look, I know I get excited about dressings, but it’s for good reason. A really great dressing totally makes or breaks a salad situation, and this one is no exception. I recipe tested this three times to get it just right, and RIGHT. IT. IS. Combine all of those things in the right proportions and you’ll get MAGIC my friends. Finger and spoon lickin’ magic. Thin the dressing out with a little bit of water, a tablespoon at a time, until it’s pourable and tossable. Toss it all. Sauce it all. Toss a little more. You’re done. This recipes makes six pretty generous portions, so it’s super perfect for meal prep. Portion it into meal prep containers, and top with some extra seeds and nuts for good crunchy measure. It’ll keep in the fridge for about 5 days. If you just cannot stand yourself you and need it in your face right now, you can do that too. I had this on it’s own for lunch and I was super satisfied. No side dish needed. If you want to round it out, have it with a cup of soup or some seasonal fruit. Naturally paleo; make it Whole30 by leaving out the maple syrup in the dressing. If you prefer a little sweetness, substitute with 1 tbsp date syrup or 4 soaked dates. If you love this healthy chicken salad, you’ll love these other meal prep-able recipes! DID YOU MAKE THIS HEALTHY CHICKEN SALAD? I WANT TO SEE YOUR CREATIONS! SNAP A PICTURE AND SHARE IT HERE ON PINTEREST. 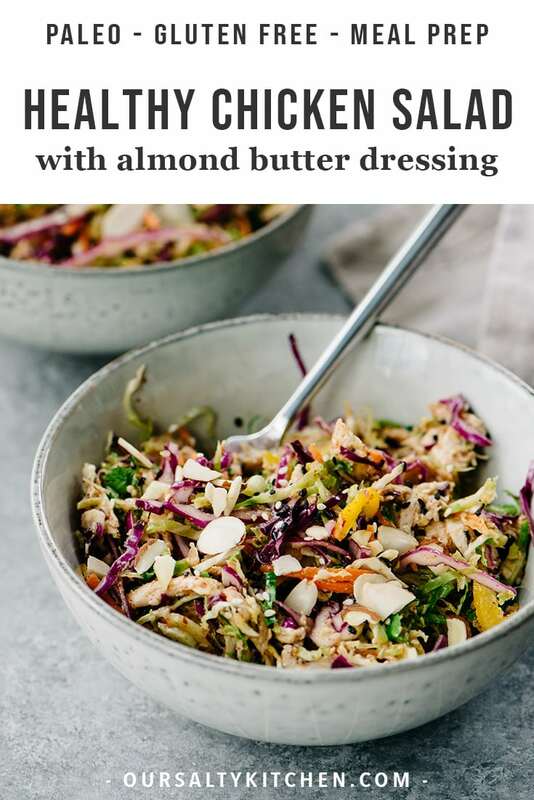 This healthy chicken salad with no mayo almond butter dressing is a fast, easy, and protein packed paleo and Whole30 meal prep recipe. 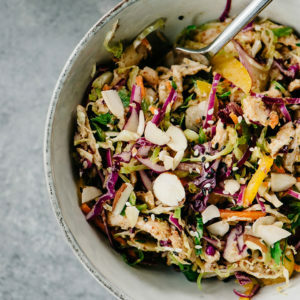 Place the cabbage, brussels sprouts, bell pepper, carrots, sesame seeds, almonds, cilantro, and chicken into a large bowl. Toss to combine. 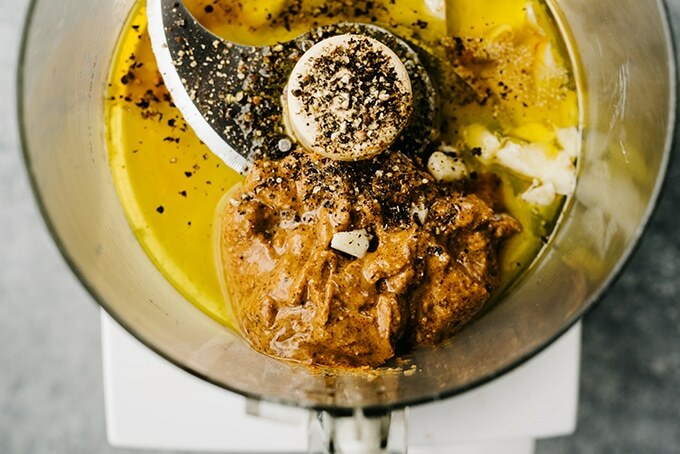 Place the almond butter, olive oil, rice vinegar, maple syrup, sesame oil, garlic, salt and pepper into the bowl of a food processor. Process until the garlic is minced and the consistency is smooth. Turn the motor to continuous and add the water through the feed tube, a tablespoon at a time, until the consistency is smooth and pourable. Scrape down the sides at least once to ensure all ingredients are incorporated. Pour the dressing over the chicken salad and toss thoroughly to combine. Portion into bowls and top with additional nuts and seeds if desired. Alternatively, portion into meal prep containers. This salad keeps in the fridge for up to 5 days. To make Whole30 compliant, omit maple syrup in dressing. Substitute with 1 tbsp date syrup or 4 soaked dates. Be careful to use sugar free almond butter.